Nigeria « Justice In Nigeria Now! Chevron filed a motion seeking $485,000 in costs from the Nigerian villagers who sued the company for aiding and abetting shootings, killing and torture in U.S. federal court this fall. According to the most recent UN statistics in 2006 the per capita income for a Nigerian was $912. Justice in Nigeria Now! (JINN) notes that Nigerians living in the Niger Delta’s oil producing communities are the poorest in the country and although there are no readily accessible per capita income figures for a resident of the Delta, it is certain that the figure is significantly lower than for the population of country taken as a whole. JINN’s founder, Laura Livoti says that Chevron’s attempt to squeeze nearly half a million dollars out of poor villagers who don’t even have access to clean drinking water and who had wanted jobs with the company is a dramatic illustration of Chevron’s heartlessness. To get a sense of what Chevron is asking of these villagers you need to understand that $485,000 could sustain the people of at least four or five Ilaje villages of a few hundred people in the Niger Delta for a year. Contrast this request for $485,000 (nearly $200,000 for making photocopies) of poor villagers with the $23.4 billion in recordbreaking profit the company earned in 2008. While Chevron claims to be sympathetic to those who live where it extracts oil, the fact that the company would further impoverish the very people whose lives their operations have devastated and who were shot by the Nigerian military who were flown in and paid by Chevron is a perfect representation of the wide gulf that exists between reality on the ground and the executives in the headquarters and public relations suites located comfortably in the San Francisco Bay Area. Although the jury did not find Chevron liable in the Bowoto v. Chevron case, the fact that Chevron flew in the notoriously brutal military who shot killed and injured Nigerians staging a peaceful unarmed sit-in on the oil platform was not disputed by the company. See recent article in the LA Times for further information on this story. The Nigerian witnesses and plaintiffs send you their thanks and regards from the Niger Delta. After nearly three months in the San Francisco Bay Area during the human rights trial against Chevron, all of the Nigerians are safely and happily back at home. Although the U.S. jury did not hold Chevron accountable for its actions, it was never refuted in the Northern California District Court that Chevron paid and transported the Nigerian military to the platform in May 1998 and that two people were killed and several others injured by the military and police. The jurors, who avoided eye contact while their verdict was read, slipped silently out of the courthouse bypassing the media and the attorneys. Though we can’t tell you why the jurors came to the decision they did, we can tell you that for the Nigerians to prevail on any count all 9 jurors had to agree. The Nigerian Ilaje and Itsekiri who were involved in this court case did not leave California with a sense of defeat; in fact the message that was declared throughout the days after the trial was one of victory to have made it this far and that “the struggle continues.” Immediately after the trial ended, having seen how organizations in the United States work, the Nigerians asked for help in building stronger local organizations in the Niger Delta with the goal of eventually creating a network to work together. JINN was able to arrange for an initial meeting with an organizational development professional to help them brainstorm initial organizational questions in the wake of the verdict. JINN hopes to be able to continue to provide appropriate support as the Nigerians actualize this thinking at home. The Ilaje and Itsekiri returned home bolstered by meeting many supportive allies across the Bay Area and with the knowledge that they are not alone in this struggle. While they were in the Bay Area they met community members in Richmond, CA who live next to the Chevron refinery and are suffering from asthma and cancer as a result and with activists who have challenged Chevron for its highly polluting tar sands operations in Canada and those supporting the lawsuit against Chevron for the toxic mess in the Ecuadoran Amazon. They left with an understanding of their role in a greater movement that demands oil companies and all extractive industries conduct their business while respecting human rights, enhancing local community livelihoods and protecting the environment where they operate. JINN endeavors to continue to build on our relationships with our Nigerian allies. SAN FRANCISCOO Monday, December 1, a US district court jury acquitted San Ramon-based Chevron Corporation of complicity in human rights abuses. The case of Bowoto v. Chevron, which pitted Chevron and its relationship with the notoriously violent Nigerian police and military against Nigerians who peacefully protested the destruction of their environment and livelihood by Chevron’s oil production activities. Despite the verdict, corporate accountability advocates vowed to continue the struggle to bring Chevron and other corporations to justice for human rights violations they commit overseas. “The fact that Bowoto v. Chevron made it this far in the process is a victory in and of itself, because it means that we have demonstrated that there is a clear pathway in the US court system for holding corporations accountable to the rule of law. This is the first time a case against a company for aiding and abetting human rights violations overseas has even gone before a jury. And although we are disappointed that the plaintiffs did not prevail in this case, we are heartened by the fact that we are now entering a new era in the United States and abroad where people have seen the results of unregulated corporate excess (in the financial system and elsewhere) and want corporations to be reined in to prevent serious harms. Bringing this case to trial in the United States is a step on the path to corporate accountability. In the near future, corporations will no longer have a free ride to do operate with impunity in ways that are destructive and dehumanizing,” said Laura Livoti, founder of the group Justice in Nigeria Now. “Regardless of the verdict, the Bowoto v. Chevron case represented a watershed in terms of corporate accountability. The details of the Nigerian case – of human rights abuses in the global operations of the oil and gas industry – can be replicated many times over in different industrial sectors in different parts of the world. Now communities around the world know that they have recourse to legal mechanisms to bring corporations that violate their human rights to justice,” said Michael Watts, a professor at UC Berkeley and author of numerous books on the Niger Delta, including Curse of the Black Gold: 50 Years of Oil in the Niger Delta. Bowoto v. Chevron concerned a 1998 incident in which Nigerian soldiers and police shot unarmed residents of the Ilaje community in southern Nigeria who were staging a nonviolent sit-in at Chevron’s offshore Parabe Platform to demand that Chevron change its practices. Chevron’s operations have devastated local communities’ access to food and clean water. The protester also demanded that the company support the local economy by hiring local residents. In response to the peaceful protest, Chevron summoned the notoriously violent Nigerian police and military and transported them in Chevron helicopters to the oil platform. Under the supervision of Chevron personnel, the Nigerian military and police killed two protesters and permanently injured others. Several protesters were taken to Nigerian jails, where they were tortured. The jury was charged with deciding whether Chevron aided and abetted the Nigerian military, in violation of international law. The legal basis for the case was the Alien Tort Statute, a law that enables foreign victims of human rights violations by corporations to hold a US corporation accountable in US court for violations of the law of nations overseas. The Alien Tort Statute has been used in cases charging Unocal with violating the human rights of Burmese villagers during the construction of an oil pipeline in Burma, and charging Yahoo with giving the Chinese government information that allowed it to identify and arrest a Chinese dissident. Both of those cases ended in out-of-court settlements. Bowoto v. Chevron would have been the first time a U.S. corporation has been held liable by a jury in U.S. courts for aiding and abetting human rights abuses committed overseas. Be sure to read the Bowoto v Chevron Blog for a full account of the court proceedings since the trial opened on October 27. On Monday Chevron will present its final day of testimony and evidence. Closing arguments will be given on Tuesday, November 25 and jury deliberations will begin on Wednesday, November 26, the day before Thanksgiving. It’s unknown how long the jury will deliberate, but this landmark case could hear a verdict very soon. We encourage those of you in the Bay Area to quietly and respectfully observe the closing arguments on Tuesday to show your solidarity with the Nigerian plaintiffs who have worked so hard to bring their case to Chevron’s home town. Go to 450 Golden Gate, 19th floor Courtroom 10 in San Francisco. Court is in session from 8:30am-3:30pm on Tuesday November 25. Last week in San Francisco’s Federal District Court, Democracy Now! host Amy Goodman was sited in a deposition given by Sola Omole, Chevron’s General Manager of Public Affairs in 1998. In 1999, Goodman traveled to Nigeria to report on the May 1998 shooting that took place on the Parabe oil platform where Chevron sent in the notoriously violent Nigerian military to shoot unarmed protesters who were protesting environmental damage and lack of jobs. The incident led to the Ilaje villagers suing Chevron for human rights abuses. In the video below Omole admits – for the first time – to Chevron paying and transporting the Nigerian military to the platform that day. Additionally, James Neku, Chevron’s head of security at the time, whose deposition was also read into court late last week admitted to being on the helicopter that brought the military to the platform. 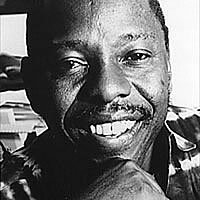 This week marks the 13th anniversary of the death of famed Nigerian activist, Ken Saro Wiwa. On November 10, 1995 Wiwa and 8 other Ogoni activists, known as the Ogoni 9 were ruthlessly executed by the then Nigerian dictator, Sani Abacha. Wiwa and his colleagues were members of the Movement for the Survival of the Ogoni People (MOSOP) who peacefully protested against Shell Oil and the Nigerian government for human rights abuses and environmental damage in their community. Early next year, Wiwa’s son will have his day in court in New York when it will be decided whether or not Royal Dutch Shell will be held liable for their complicity for human rights abuses against the Ogoni people in Nigeria, including summary execution, crimes against humanity, torture, inhumane treatment, arbitrary arrest, wrongful death, assault and battery, and infliction of emotional distress. Similar to the case against Chevron currently being heard in the Northern California Federal District Court, the two cases against Shell were brought under the Alien Tort Statute (ATS). In addition, the Shell cases will be tried under the Torture Victim Protection Act (TVPA). The cases also allege that the corporation violated the Racketeer Influenced and Corrupt Organizations (RICO) Act, according to Earth Rights International, co-counsel for the case. Wiwa was known for his ability to mobilize hundreds of thousands of peaceful protesters that successfully drove Shell out of their community. His death serves as a shift in Nigerian history when political and social unrest in the Niger Delta was addressed in a peaceful way to a gradual move toward a violent approach that faces the Niger Delta today. The current violence stems from decades of demands not being met, and corruption and divide and rule tactics that continue to tear the region apart. Violent responses were taken to new levels in 2006 with the formation of the well armed group – the Movement for the Emancipation of the Niger Delta known as MEND. The former chief hostage negotiator for New York City police, testifying as an expert in a trial over the shootings of Nigerian villagers on a Chevron oil barge, said Monday that the villagers were not holding employees hostage and that the company should not have summoned the Nigerian military. Larry Bowoto, whose suit accuses the oil giant of human rights violations, says he was shot four times although unarmed. He is the lead plaintiff in the legal action. Reporting from San Francisco — A Nigerian villager who is suing Chevron Corp. for human rights violations testified in federal court Thursday that he was shot four times by Nigerian troops at a Chevron oil platform even though he was unarmed.